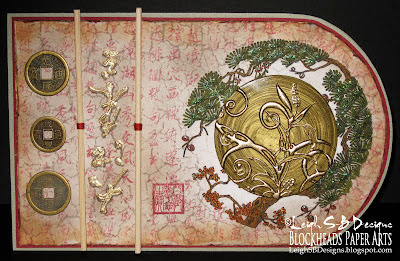 Velvet Paw Creations: "Chinese Medallion Card" Melt Art Texture Tread Series for Blockheads Part 3! 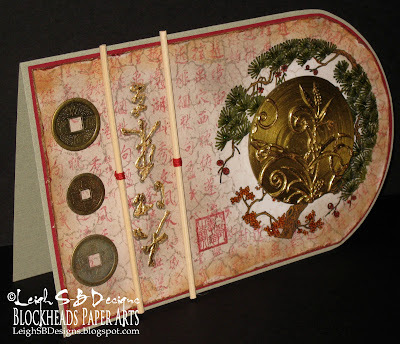 "Chinese Medallion Card" Melt Art Texture Tread Series for Blockheads Part 3! I'm back with another Melt Art Texture Tread project and this time its an awesome Chinese inspired card featuring a gold UTEE medallion! 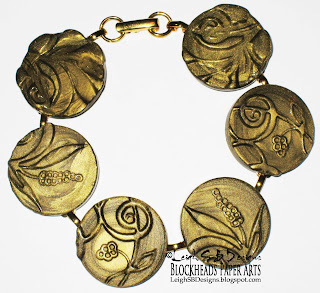 I've been working on some Melt Art projects for Blockheads Paper Arts for the last couple of weeks and so far you've seen a gold UTEE bracelet and a pendant made with clear UTEE with Perfect Pearls mixed in to give it a luscious shimmer! Click on the two photos below to go directly to those tutorials if you missed them! This time I'm excited to share a mixed media project with a Chinese theme! The gold UTEE medallion really makes a dramatic statement don't you think! To create the medallion I used the same Melt Art Texture Tread by Ranger that I made my two previous projects with. The Texture Tread is called Floral Flourishes and I used gold UTEE and a large round cookie cutter to create the shape. For detailed instructions on how to work with the Texture Treads please check out Part 1 and Part 2 in my tutorial series! I really love the swirled effect created as I poured the molten UTEE. It reminds me of a tree's growth rings and adds to the Nature theme of the design. The gold medallion really is quite beautiful as is but I decided to try out something different and applied gold leaf to just the embossed design! 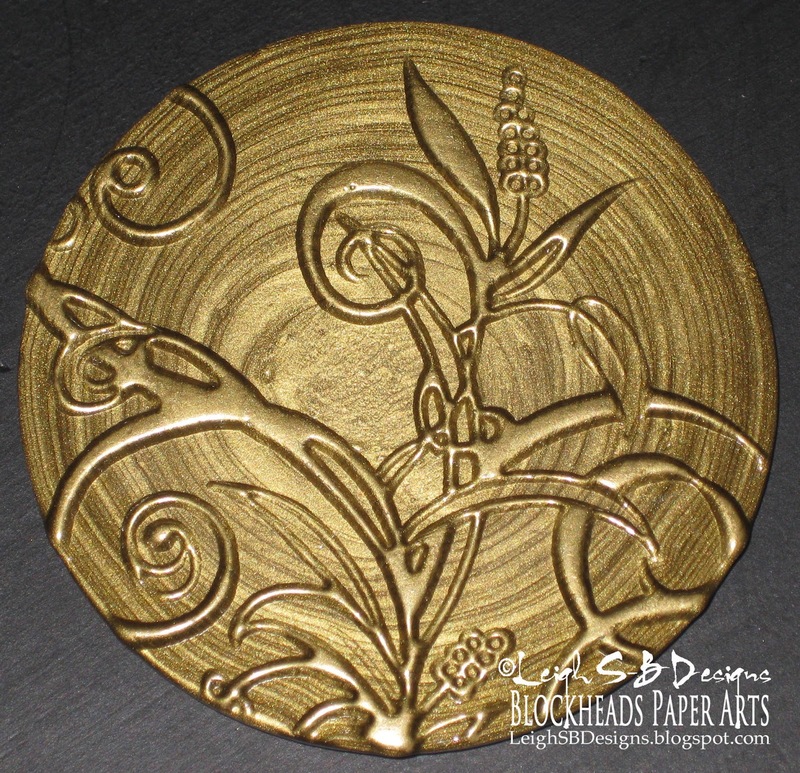 I painted the design with leafing size/glue and applied the gold leaf. 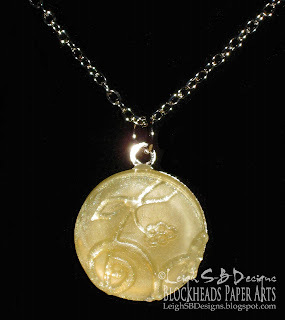 The luxurious glow of the precious metal really makes the medallion look even more special which gave me the idea to transform it into a sacred medallion found on an ancient Chinese scroll. So that's how this card came about! 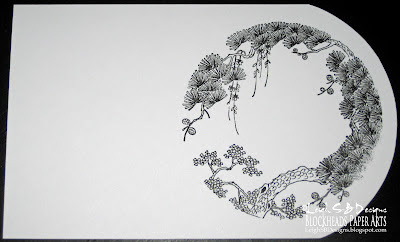 Stamp the gorgeous Chinese circle image found on the Chinese Traditional Full Sheet #2 exclusive to Blockheads Paper Arts onto the cardstock with Onyx Black VersaFine ink. Colour the image with Tim's new Distress Markers. I used Peeled Paint on the greenery, Fired Brick on the cones, Tea Dye on the tree trunk with a touch of Pumice Stone for shading and Dried Marigold on the blossoms. Apply Pumic Stone Distress Ink to the white cardstock with an ink foam applicator. When most of the ink is off the foam gently swipe it across the white area inside the circle just for a very subtle hint of colour. Stamp the Crackle Background from Blockheads exclusive Backgrounds for All Occasions sheet with Pumice Stone Distress Ink all over the cardstock and around the outer edge of the circle. Also stamp the crackle inside the circle leaving just a faint impression. psst..the single Crackle background stamp is currently on sale! Over stamp the crackle background with a faint Chinese script from the Chinese Princess set in Rhubarb Red Memento ink. To get the look of faded writing ink up the stamp and press it onto scrap paper first to remove most of the wet ink and then stamp the cardstock. Distress the edges of the cardstock with Tim's Distress tool and apply Tea Dye Distress ink, then Rhubarb Stalk Memento ink and finally a touch of gold with a metallic paint pen to the distressed edges. 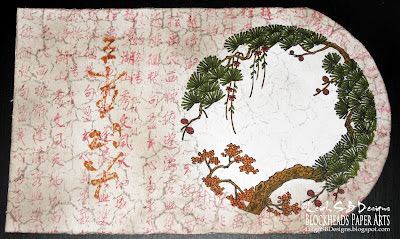 Stamp the large Chinese script onto the panel with Tea Dye Distress ink and paint over the impression with gold leafing size/glue. Once the adhesive is ready apply the gold leaf to it. I added a drop shadow to the gold leafed script with a touch of Pumice Stone Distress marker to give it more dimension. Stamp the square Chinese Chop with Rhubarb Stalk. I decided to go with the square one to mirror the square side of the card. Apply yellow glitter glue to the greenery and all the blossoms in the stamped image and while that dries prepare the rest of the card. Cut a mat from dark red cardstock and then make a top fold card from sage green cardstock to match the shape. Wrap two wooden reed sticks from a mini Reed Diffuser with traditional red Chinesse silk cord (I picked this up in Montreal's China Town). Layer and adhere all the mats and the stamped panel with double sided tape and embellish the card with all the pieces. 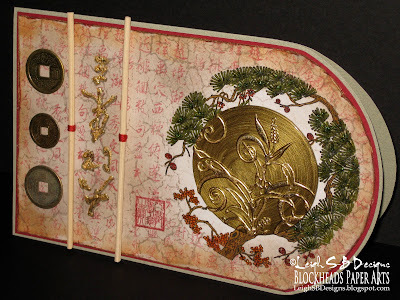 Adhere the reeds, the 3 authentic Chinese coins and the gold medallion to the card with small dabs of craft glue. use 3 different embellies - I used coins, reeds and the UTEE medallion! Wow!!! Leigh, I love this card! 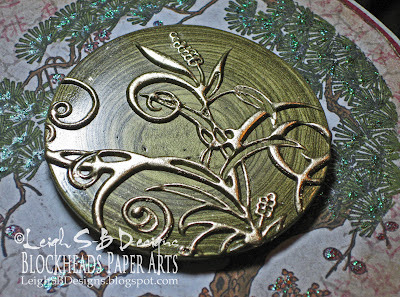 Love how you stamped the circular image and how you used the crackle stamp in the background. the medallion looks so pretty as the focal point. Love it all. Great card - I love that gold UTEE medallion! Thanks so much for joining us in this week's Simon Says Stamp and Show Challenge! Wow! Leigh your card is so beautifully made!! Love the unique embellishments and the utee medallion! Thanks so much for sharing with us at Crafty Creations this week, we hope you'll play with us again! Best of luck! An absolutely beautiful card, I love all the detail, Thank you for joining in with us at Hooked on Craft this month, Good Luck. This is just stunning, Leigh! I really need to get some melt art stuff so I can play! Beautiful Leigh! I will have to give something similar a try!